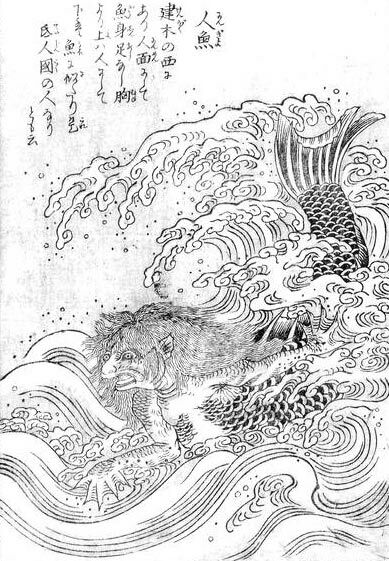 The ningyo, which translates as human fish (known also as gyojin, meaning human fish , or hangyo-jin, meaning half-fish human ) is a creature in Japanese folklore that is comparable to the mermaids in Western legends. Despite the similarity in concept, i.e. the ningyo and mermaid being creatures with both terrestrial and marine body parts, these two entities are actually quite different. For example, in Western folklore, mermaids are generally regarded as beautiful, seductive beings who would lure men to their deaths. As for the Japanese ningyo, there is no such ‘standard’ story, as these creatures not only vary in the way they look, but also in the way they are said to interact with human beings. Unlike their Western counterparts, the Japanese ningyo, in general, are much less attractive. They are often portrayed as creatures with the top half of a monkey and the bottom half of a fish. 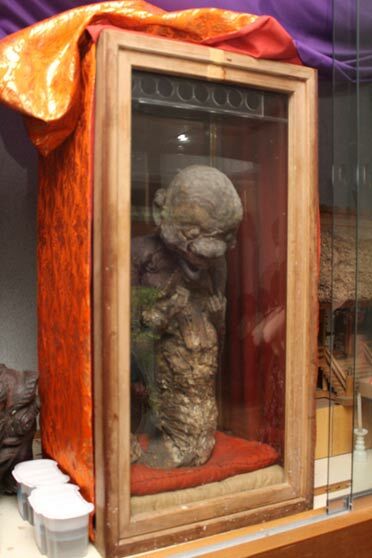 Such ningyo have also been made by the Japanese, one of the most famous examples being P. T. Barnum’s ‘Fiji Mermaid’ . Nevertheless, there are also ningyo which bear even less resemblance to the mermaids of the West. For instance, it has been claimed that in numerous local traditions, the ningyo do not have human (or even ape-like) torsos at all. Instead, they have just a human / ape-like / reptilian head attached to the body of a fish. At times, these heads are depicted grotesquely, i.e. misshapen / horned / with a mouthful of razor-sharp fangs. There is also a type of ningyo known as the amabie / amabiko, which is said to have the beak of a bird, and is covered with scales from the neck down. The ningyo are believed to have mystical abilities, and a variety of magical aspects have been attributed to them. For example, they are often said to be able to cry tears of pearls. In addition, some ningyo, like the amabie, are thought to be able to foretell the future. In one story recorded during the 19th century, an amabie is said to have appeared and prophesized both good harvest and the plague. Additionally, the amabie mentioned that in order to avoid the plague, people should make an image in its likeness. Other ningyo are reported to be less benevolent, and are capable of shape-shifting, an ability which they supposedly use to lure men into the sea, and their deaths. The most well-known belief about the ningyo’s supernatural powers, however, is that by eating their flesh, one is able to gain eternal life, or at least an extremely long life span. There are numerous stories telling of the magical qualities of the ningyo’s flesh. Still, none is more famous than that of the ‘Happyanku Bikuni’ (meaning ‘800-year-old Buddhist nun’). The Strange Merman of Banff: Legendary Lake Monster or Just a Trading Post Treasure? This tale begins with a fisherman who caught a ningyo. He invited his friends to his house for a meal, though he did not reveal to them that they were going to have the flesh of the ningyo. His friends, who guessed the source of the meat / found out about it without the fisherman’s knowledge, did not eat the food. By chance, however, the fisherman’s young daughter ate the meat. She stopped growing at the age of 15, and eventually became a nun, wandering about until her death at the age of 800. The ancient Japanese believed in the existence of the ningyo, and even have physical evidence for its existence. The Tenshou-Kyousha Shrine in Fujinomiya houses the preserved body of a supposed ningyo. According to a legend, a ningyo once appeared to a Japanese prince. As the creature was about to die, it told the prince about how it became such a creature. Apparently, this ningyo was once a fisherman. As a result of trespassing protected waters in order to fish, a curse was laid on him, which transformed him into a ningyo. The fisherman learned his lesson, and requested the prince to found a shrine where his preserved remains may be displayed. This was so that all who viewed the body of this creature may be reminded of the sanctity of life. 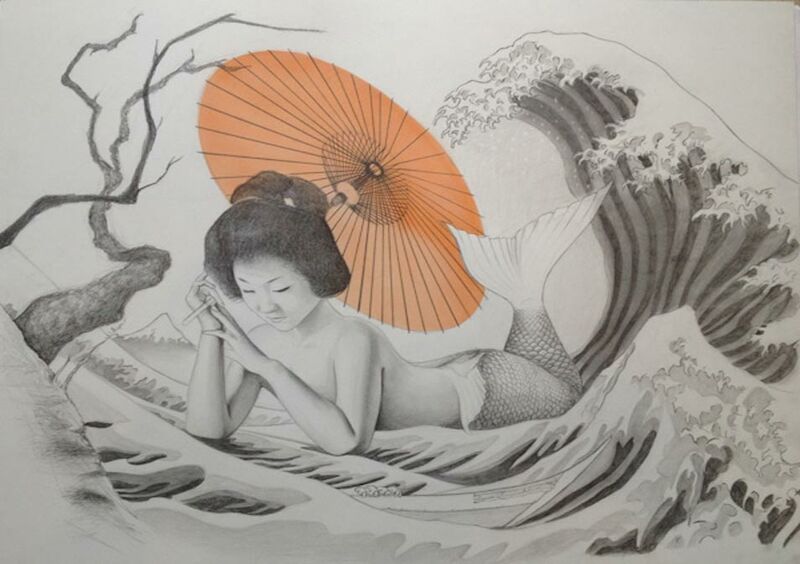 It is possible that this ningyo is one of the earliest specimens of ‘mermaids’ created by the Japanese, the most famous of which was the Fiji Mermaid.